I am so delighted! 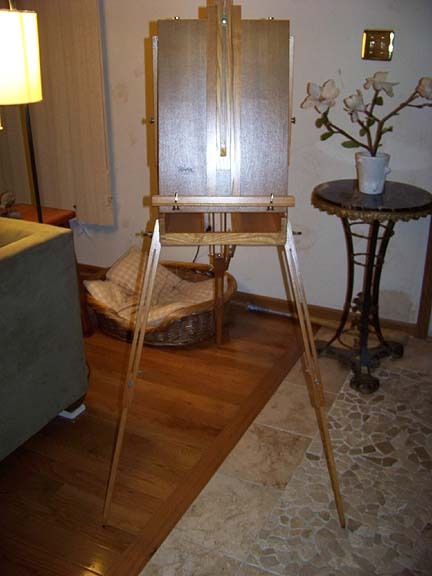 I just happened upon Craigslist the other night and I found this easel. It is a vintage French easel and it’s in perfect shape. What is nice about it is it folds up to become a carrying box that will hold painting supplies, too-perfect for travel. 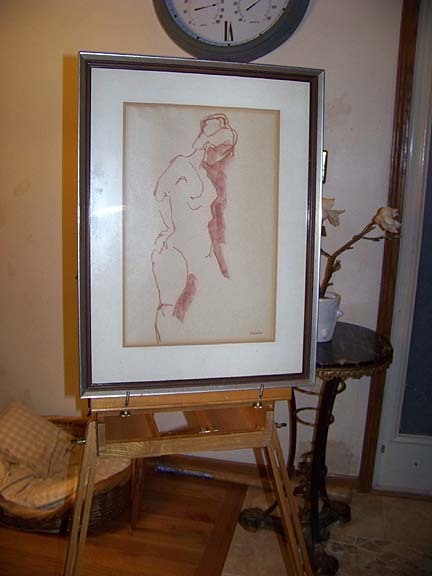 The guy was also selling left over things from a past rummage sale, and I spotted this framed pastel drawing, so I had to have it for $10. Love it! “Get goin’ on it Em! What great finds! I’ve been addicted to craigslist lately….have been selling more than buying, but it’s such a treasure trove and especially to know that you can just drive on over and get the stuff and not have to wait to get it in the mail….love it…..REALLY love the picture you got! Love craig’s list as well-miss it here in Germany! We have something called Ramtein Yard Sales but it is NOT AS LUCRATIVE! From a fellow flyer, KEEP FLYING! I have an easel just like that one!! p.s. I really love your dolls and your art!